When my almost 9-year-old son asked for a drone for his birthday, I wasn’t sure what to think. I knew drones were all the rage and that some of his friends had them. A neighbor told me she found a crashed drone in her backyard and was trying to find the owner. I didn’t want to buy something that would break right away or get lost. Well, it turns out there are good options for kids that prevent damage and keep a drone from getting lost. That’s a good thing because my son is an adrenaline junky, so I knew he’d love a drone that could do a variety of tricks. Knowing that he would attempt a lot of tricks, I also knew I had to purchase a drone that could take some fairly hard crashes without breaking. One that could take pictures or video would also be a big plus. Note: Most drones are recommended for kids ages 14 and up. 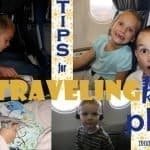 After some good adult supervision, responsible younger kids could be capable of flying on their own. Also, because of the relatively small size of all the items on this list, none of them require registration with the FAA. What Features Should Your Kid’s Drone Have? There is a wide range of features and prices when it comes to drones. Additionally, some are much easier to maneuver than others. When looking for kids control range, charging time, and flight time are important. Control range is how far you can be from the drone and still fly it. You can expect control range to coincide with price—the more expensive it is, the larger the control range. Most of the drones on this list have a flight time of under 10 minutes. Then they have to be charged again. Be sure to take into consideration the both charge time and flight time before making a purchase. Typically, they come with rechargeable batteries, and remote controls usually require AAA batteries. I like a headless flight system. This means you have control of what direction the drone flies no matter where it is (within range). The orientation of the drone doesn’t matter when you have a headless flight system, meaning it doesn’t matter which direction the vehicle is pointing, it will still respond to the controller. This makes it much easier for beginners and children to control. Another helpful feature is the one key return. It allows you to press a button and the drone will return to the controller. I don’t know about your kids, but I am pretty sure without this feature we would have spent hours hunting in neighboring yards for my son’s drone. A camera is a definitely something most kids would love to have on a drone. 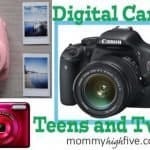 Depending on the quality of the camera, kids can take some pretty exciting photos or videos. This is especially fun at a birthday party, wedding, or other event. It can also make for some interesting spying…Maybe adult supervision would be wise. The propeller blades on most of these drones are made of fairly flimsy plastic. It’s worth noting if there are extra blades included or if you can purchase them separately. Some drones also come with blade protectors, which can be very helpful in prolong the life of the blades. The eBo Trade RC Quadcopter is an excellent option for young children and those just learning to fly a drone. It is easy to use, inexpensive, and fun. You can fly this copter indoors or outdoors, and it’s small enough to fit in the palm of your hand. Even at such a low price, it’s got some great features including headless mode, one key return, and LED lights. It also comes with a full 12 month warranty, which most of the others don’t have. 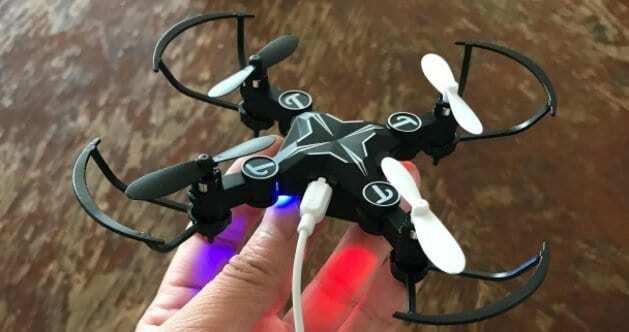 The package comes with a copter (with chargeable battery), remote controller (AA batteries not included), USB charger, extra propellers, and a user manual. 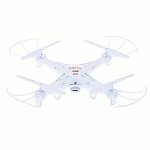 Overall, the eBo Trade RC Quadcopter is an excellent choice for young children or beginners. 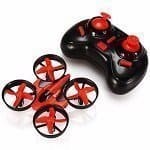 This mini drone for kids is fun to fly and responds well to the controller. 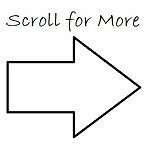 However, eventually, you will probably want to move on to something bigger with some more features. 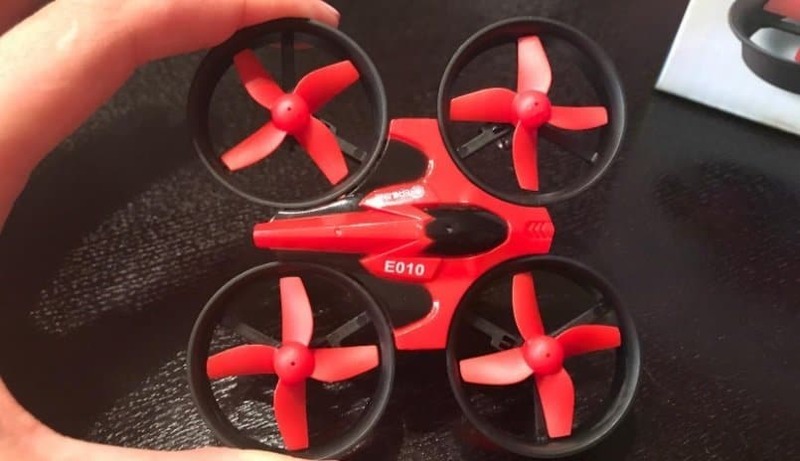 The Eachine E010 Mini Quadcopter is a good mini drone option for younger children. Its small size makes it easy to fly indoors or outdoors. 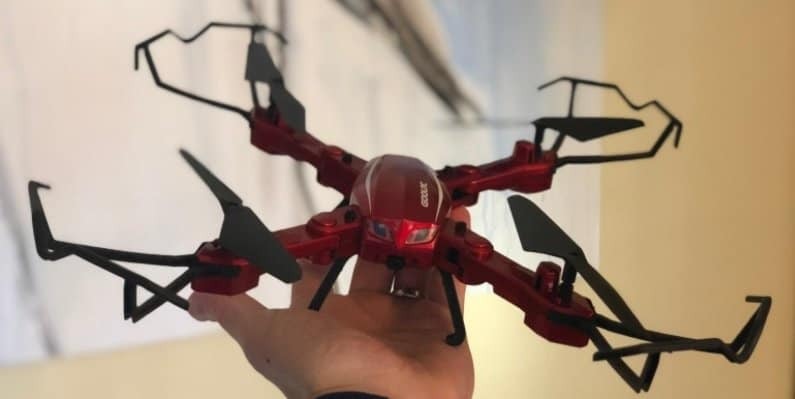 It comes with some nice features including one-key return, 360° roll-over, and compass mode (the drone changes directions with the remote control is turned). The package comes with the quadcopter, remote control, USB charger, 4 extra propeller blades, and a user manual. The quadcopter has a rechargeable battery and the remote control requires AA batteries (not included). 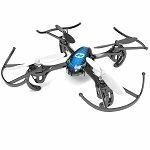 The Eachine E010 Mini Quadcopter is a good choice at this price. However, be aware that it likely won’t be a long-lasting toy. It’s great for learning how to maneuver a drone and to see if your child is interested in something that will cost more money. If you are looking for something longer lasting, keep looking down this list. If you want to get your 5 or 6 year old boy a drone this is probably your best bet. This is a good option for a young beginner. The Skyracer is considered a quadcopter (a mini drone). It folds up to fit inside the controller, and when fully assembled it’s small enough to fit in the palm of your hand. It comes with a headless mode as well as a one-key function for take off and landing. Three speed modes make handling the Skyracer easy for children. It comes with a rechargeable battery for the Skyracer itself. The remote control requires four AAA batteries (not included). Included with the Skyracer are four extra propellers, four propeller guards, a propeller crowbar, a USB charger, and a user manual. Overall, the Skyracer is a good basic beginner mini drone. It doesn’t have the fancy bells and whistles, but it’s a good option to get kids started. Compared with other options in this price range, the Skyracer isn’t our opinion quite as good. The Holy Stone HS170 Predator Mini is a great choice in this price range. It has some nice features including a headless mode, 3D flip and roll, and LED lights for night flying. Three speed modes make this model fun for a novice or for an advanced flyer. Additionally, the Predator Mini is wind resistant, meaning a normal wind gust won’t carry it away. I like that the 6-axis gyro stabilization system helps to steady the Predator after a trick or sudden move; it is helpful especially for beginners. The package includes the Predator Mini (with a rechargeable battery), a controller (AA batteries not included), a USB charger, 4 extra propeller blades, and a user manual. Overall, the Predator Mini is a great choice. The extra features make this kid’s drone easier to fly than the Skyracer Mini. The Syma X5C is another good choice in this price range. Unlike the above options, the Syma X5C-1 is equipped with an HD camera. However, the camera quality is mediocre.Like the Predator Mini, the Syma X5C-1 has a 6-axis gyro stabilization system to make help maintain stability during flight. This model is also wind resistant, and unlike some of the other options on this list, it can be flown indoors. The Syma X5C-1 has a 360 degree flip function as well. It is fairly easy to fly, but it is more suited for beginners than for experienced flyers. 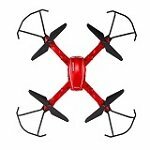 The package includes the Syma X5C-1 copter (with rechargeable battery), remote controller (AA batteries not included), USB charger, 4 extra propeller blades, 4 extra protection frames (propeller guards), a card reader, and user manual. Just a word of caution, when the low battery indicator comes on, there is very little time to land. You could end up with your copter falling from the sky. This drone would be a good choice for a 10 to 12 year old boy or girl who loves drones. The DBPower MJX X400W FPV Drone is a good product for teens or those who have had at least a little experience flying a drone or quadcopter. It comes with all the bells and whistles: headless mode, one key return, 3D flip and roll, switchable speed modes, and a wifi camera. That means you can do tricks while recording what your drone would be seeing. Simply download the app to your IOS or Android phone or device and watch in real time as you fly your drone (or maybe have someone else record it for you and watch after landing). The camera quality isn’t crystal clear, but it is fun to watch. You can save your photos and videos either on the app or on the TF card. 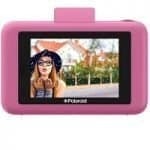 Have fun sharing your videos with your friends! The DBPower MJX X400W FPV has a longer range (100 meters) than the previous items on this list, which means more fun for you. 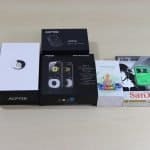 The package includes a drone with camera and rechargeable battery, remote controller (batteries not included), 4 extra propellers, USB charger, and user manual. Overall, the DBPower MJX X400W FPV is a drone that will provide hours of enjoyment. The wifi camera makes flying even more enjoyable, as you can use it to document your event or simply whatever surroundings you encounter. You will not be disappointed with this purchase. The GoolRC T5W PRO FPV drone is an excellent choice at this price. It comes with a 720 HD wifi camera that takes good quality photos and videos (definitely better than those of the DBPower MJX X400W FPV). It is also foldable, which makes it easy to store and transport. Like most of the others on this list, the Gool RC T5W PRO has a headless mode, one key return, and 3D flip capability. It also has a gravity sensor function, which allows you to control the drone by tilting your phone. Download the app and you can use your phone instead of the controller. There is even a Flight Planning option which allows you to draw a flight plan on your phone and the Gool RC T5W PRO will follow that flight plan—pretty impressive! 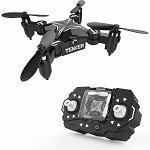 The package includes a quadcopter with camera and rechargeable battery, remote controller (AA batteries not included), 2 extra propellers, a flip phone holder, a USB charger, and a user manual. There are a couple drawbacks, though. The package only gives you 2 extra propellers, while most others come with four. Also, the paint seems to come off pretty easily. This model does better outside than indoors. The battery charger has a very thin wire that could easily be broken if you are not careful. Overall, the Gool RC T5W PRO FPV is, in my opinion, the best option at this price point. It has all the features of the others plus a better camera, gravity sensor, and flight planning. If you want to have some real fun with the drone and the camera, go with the Gool RC T5W PRO FPV. 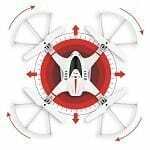 For some fun check out NASA’s analysis of drone Aerodynamics.